In case you missed it, living is San Francisco is REALLY F-ING EXPENSIVE. Which makes any story about how to get food and booze for super cheap REALLY F-ING GREAT. 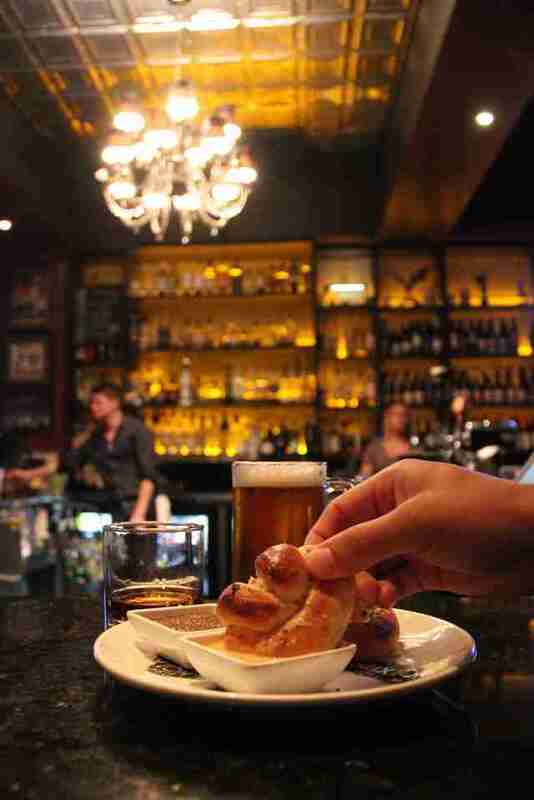 So here's one of those, a round-up of 10 spots in San Francisco where you can get a beer and a shot and a bite (aka dinner) on the cheap. 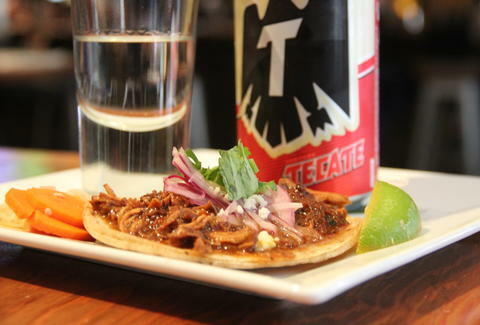 This guy has been a beer-shot-bite standby for years now, and thankfully it's available at all four Tacolicious locations. And while you can technically get any taco with the deal, if you aren't getting the carnitas, you're doing it very, very wrong. 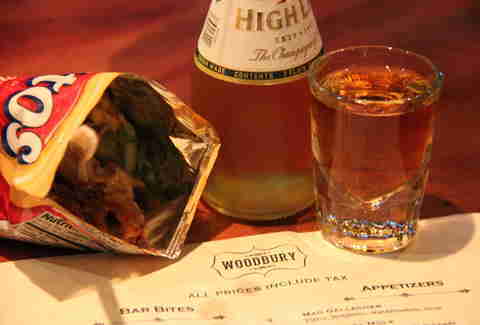 One of the best bar openings of 2014, Woodbury is somehow making playing Mario Kart in the back of the bar even more fun with this holy triumvirate that includes an adorable baby beer, bourbon, and a Frito freaking pie, served in a Fritos bag with everyone's favorite curvy corn chips swimming in chili, cheese sauce, and creme fraiche. Brixton has a pretty solid tap beer program so the "any draft beer" thing on its own is great, but throw in some 90-proof bourbon from a barrel set aside just for the bar PLUS house-made pretzel knots with whole grain honey mustard and zingy spicy Fresno chili beer cheddar cheese sauce and you've got yourself something even greater-er. First: this chicken is legit spicy -- it's tossed with cilantro root, white pepper, soy sauce, and nam prik pao. 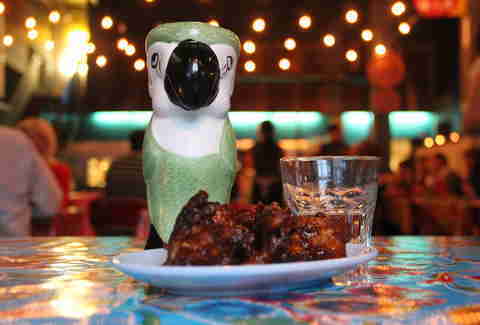 Second: if you ask nicely, your beer can come in a ceramic parrot glass, as all beers should. Guys. These chipotle meatballs are pound sign delicious with mint, garlic, and rice, meatball-ized and smothered in Jack cheese, but the really hot part of the dish is the bed of chips underneath them that you can use to clean up everything that didn't make it all the way to your face. 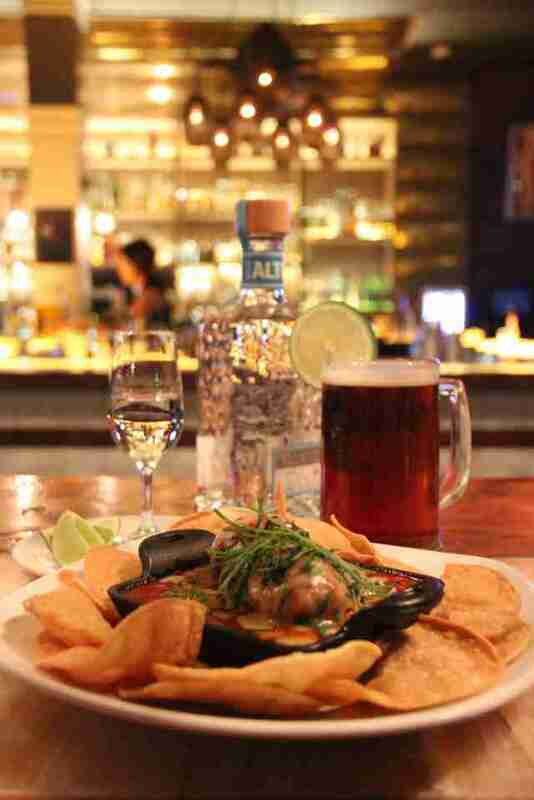 Also your pick of any of five beers on tap to go with your tequila shot: not bad. We tried to think of a reason we wouldn't have this for dinner seven days a week and we legitimately couldn't come up with one. 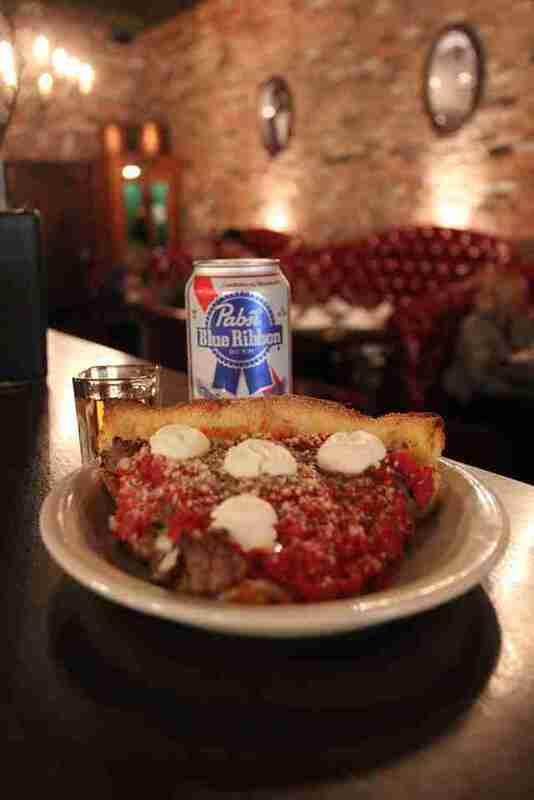 The Old Chicago slice could probably feed you for two days -- a veritable brick of tomato sauce, mozz, provolone, Chicago Italian sausage, meatball, garlic, ricotta, oregano, and Romano. And Buffalo Trace + an old man beer? Yes, please. OK, yes, this isn't a beer, it's a sangrita. But also-yes, it's a house-canned pineapple sangrita with chili peppers, Thai lychees, serranos, caramel iced pineapple juice, coffee malts, and Citra hops -- which is why we'll let it slide. 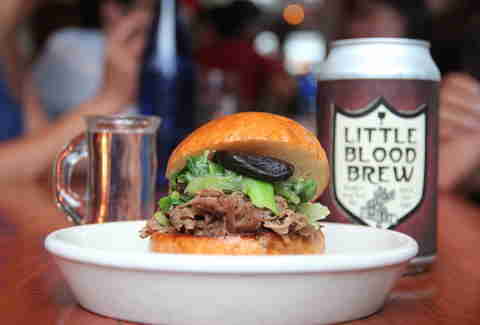 And, be honest, you'd pay $12 just for the Chinatown duck slider and a shot on their own anyway. 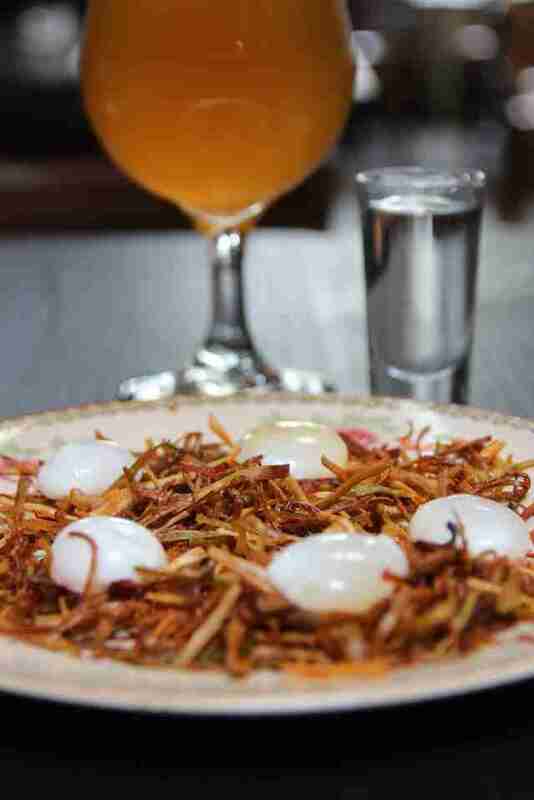 The maybe best opening of the year in SF is already hooking it up with this beer-shot-bite-age that'll include three things you would've ordered already (shot, house-brewed beer, pickled quail eggs), for a couple bucks cheaper than they'd usually run you. Pro tip: put those saved dollars toward the burger. #Trust. If you're looking for a reason to actually make it all the way down to Dogpatch (and even if you weren't!) Third Rail is it. 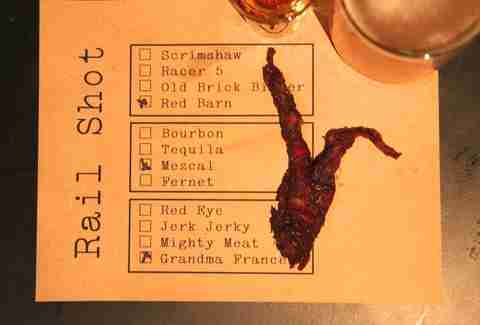 And the "RailShot" is what you'll wanna get when you arrive: $8 gets you an 8oz draft beer (your choice), a shot of Four Roses bourbon, Fernet-Branca, or Pueblo Viejo tequila (hey now), plus a half-ounce of house-made jerky that tastes a million times better than it looks in that picture. If you make it out of here without buying a bag of jerky to take home, you're a better person than I. 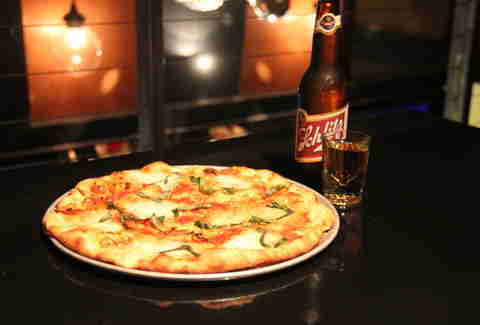 This is just like all the other beer-shot-bite deals on this list, except instead of a bite, there's A WHOLE FREAKING PIZZA. Grant Marek is Thrillist's Senior Cities Director and he tried all of these -- not on the same day though, don't worry (it was over two days). Follow him to more cheap stuff on Twitter: @grant_marek.